French street artist JR, uses his camera to reveals the reality of the world we live in today. He does this by placing photos of the human face across large canvases. The purpose of his Ted talk is to to use art to turn the world inside out and so he is doing this by using the world as his canvas. JR created his own art galleries on the sideways; this was a way he used to describe what he thought of society. As a result of his artwork viewers can truly understand what is going on both the society and world we live in. Furthermore, JR has a strong notion of art being a platform for both material and debate. .
Li Hongbo's work is very interesting. I find his work interesting because when he showed the skull that was made out of thousands of paper, it was able to make spooky like faces. When I heard that it takes thousands of papers to make these sculptures, it must take a very long time to do these sculptures. I also find the idea of pure white paper fascinating because of its meaning, "life and death". Something I found interesting is when he is able to stretch the sculptures, similar to the function of a slinky. This gives life to the sculptures as they seem very playful when you stretch them like a slinky. Overall I think this is one of those things where they take an every item and turn it into something you wouldn't imagine it was able to. Lastly, Li Hongbo's work are so realistic that his work looks as if it were made out of plastic, when in fact it is made out paper. I think Jim Campbell's work is extravagant. This is because the images he makes meaningful images through the LED light installations. An example is that he created image called "Home Movies David". It shows a boy from the moment he is born until he is 10 years old. You could really see how this boy progresses with the use of the LED light installation. Jim Campbell also says how the boy was born around his age in the video, and how he also went through the same things the boy went through in the video as well. Jim Campbell's work is very technical; but it delivers a peaceful essence. Shane Koyczan mad a poem called "To This Day," he wrote this because he wanted to give awareness to bullying. He got the help artists who helped him animate this poem and each of them gave 20-second clips. The final product was this is astoundingly stunning animation that grasps the notion of bullying. This animated video contributes to Pink Shirt Day. This is an anti-bullying awareness day in Vancouver that takes place on Feb. 27. Overall I think the message conveyed in this video is clear and that is that bullying does hurt people. If take a close look at other incidents that have happened in the past because of bullying many of them were suicide’s. A suicide next to drinking and driving are two big factors that kill teenagers today. I believe that if many people see this video and realize the spoken truth, they will have reasons for them to stop the bullying that is around them. I also believe that by stopping bullying you are making the environment positive and by having positive environment people can come together when time are tough to overcome what is in front of them together through this positive environment that they created. 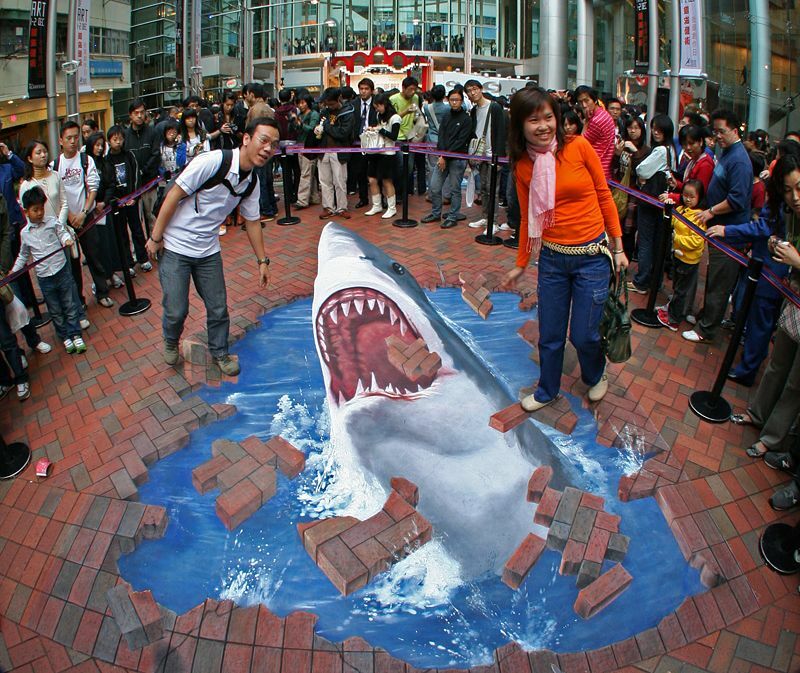 Julian Beever is a well-known chalk artist who has been creating trompe-l'œil chalk drawings on pavement surfaces around the mid-1990s. He uses a projection like technique called anamorphosis to create the illusion. Once the viewer is stationed in the right position they will clearly see the image projected in front of them. Every so often, people will somehow place themselves in chalk drawing as if they were interrelating with the chalk drawing. Robert Kirkman is a comic book writer and artist. He is famous for the work he had done on the what is today's famous television series, "The walking dead". I find his work unique because the show originated from the comics. The comics clearly portrayed a land where there is no hope because of a zombie apocalypse with its unique illustrations. Banksy is a graffiti artist, political activist, film director, and painter. He is well known for doing dark humour . His work can be found streets, walls, and bridges of cities all around the world. I find Banksy's work very intriguing because he is using the world as a canvas to give notice to the issues that our society and world faces such as human rights. We live in a world where appearance is everything. Weather your looks are good or bad, you are under pressure to meet the others expectations. We have built our confidence in ourselves based on how we look. We also have this notion that if you look good you'll have friends, and people will listen to you. However even those who are claimed to be perfect people are suffering from this situation. This is because they need to be perfect and act perfect all the time. There are a lot of people who aren’t happy with the way they look because of the idea of being perfect. This makes them miss a lot form life. I think this is very interesting because it challenges our perception as Scott Wade had said. Its also unique because since it is on a car it is able to move and so it is a mobile art gallery. I can almost relate to this because I sometimes use my finger to draw on the car window when there is fog on it, especially on long boring car rides. This is also very interesting because something you would have never thought to be big got allot of attention from various platforms and mediums. This goes to show how innovative artists can be. Theo Jansen is a Dutch artist who makes cool kinetic sculptures that are large and that move very freely on their own. He is well widely known to use PVC in his sculptures. He use both his artistic and engineering skills to make these sculptures. In a advertisement for BMW he says, "The walls between art and engineering exist only in our minds". His goal is to give his sculptures enough knowledge to avoid obstacles on their own.